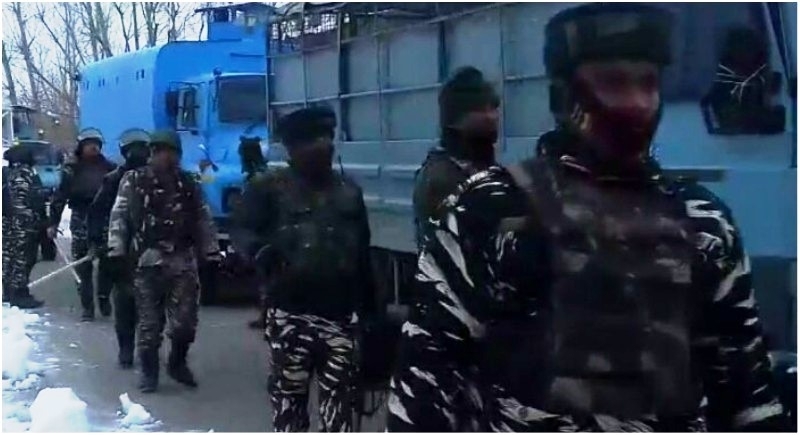 Srinagar, February 11: Five terrorists were killed in an encounter with security forces at Kellam Devsar area in South Kashmir’s Kulgam district on Sunday. The gunfight erupted in the area in wee hours after a joint team of security forces launched cordon and search operation on the basis of specific information about the presence of terrorists in the area. As the forces zeroed in on the suspected place, the hiding terrorists fired upon forces indiscriminately. The army official said five terrorists were killed in the encounter. The identity and group affiliation of the terrorists are being ascertained. Weapons and war-like stores have been recovered from the encounter site. Clashes between protesters and security forces broke out near the encounter site, but no reports of injuries have been reported. On the other side, Hurriyat Conference (G), Syed Ali Shah Geelani has paid rich tributes to five militants killed in a gunfight with the forces in south Kashmir’s Kulgam district on Sunday. Dukhtaran-e-Millat also paid tributes to the five militants, who were killed in a gunfight with the security forces.